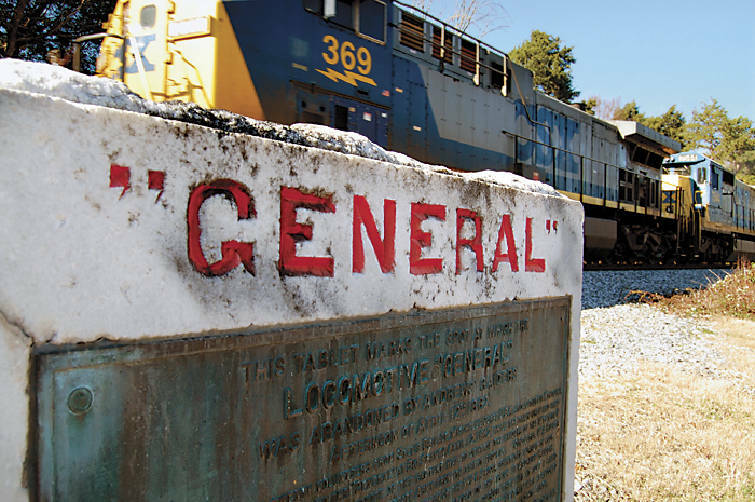 Staff File Photo by Andy Johns A train passes a 108-year-old monument marking the end of the Great Locomotive Chase outside Ringgold, Ga., in Catoosa County. The Sons of Confederate Veterans wants to help Catoosa County commissioners spend a $2,500 grant awarded to the county in 2007. The state grant can be spent only for improvements to the site where The General locomotive was abandoned at the end of the Great Locomotive Chase in 1862. The money has been sitting in an account since it was awarded as officials tried to determine how it might best be used. Members of the local Sons of Confederate Veterans camp brought up the issue at a recent County Commission meeting. "They just needed somebody like us to agitate them or at least present (ideas) to them," said John Bryson, a member of the camp. In 1862, a group of Union soldiers and a Union spy stole a locomotive, The General, in what is now Kennesaw, Ga., and drove the train toward Chattanooga while trying to burn bridges and cut telegraph wires along the way. The General ran out of steam about two miles north of Ringgold, where a large marble marker has stood since 1901. The grant will be used for improvements to the site, but commissioners and Sons of Confederate Veterans camp members have debated about an additional plaque, directional signs informing drivers of the marker or more parking space along state Highway 151, where the marker sits. After the initial meeting, commissioners agreed the county probably could get more "bang for its buck" if they opted for a marker or plaque, but commission Chairman Keith Greene asked for the veterans group to come up with recommendations. The group met Wednesday and appointed a committee to consider the options. Committee member Tom Poteet said all the options were improvements, but whatever is done needs to be completed by the 150th anniversary of the chase in 2012. Agencies have plans to promote Civil War sites across Georgia during the sesquicentennial in hopes of promoting history. "We definitely need to get it done before that," Mr. Poteet said. Bill Clark, another member of the committee, said the marker would help inform local residents, many of whom might not even know the story of the chase. "The old-timers do," he said. "The people new here in the last 15 or 20 years, I doubt it."